Very lovely work, Nella. Such clarity and crisp focus where it needs to be. I like the tryptich idea, too. Congratulations on your ribbon! Brilliant photo, if you look closely the world is in that droplet!! Congrats to you Timmi, way to go. Congratulations on the image and on the choice of text - congratulations on the family win as well. You three rock! Lovely image that goes so perfectly with your quote. congrat!!! As I wrote for Tony's picture, your family proves that it is possible, when you are motivated enough! Great family win. Beautiful bunch of pictures. Keep up the great work. I am scratching my head myself. I have no idea how did we managed to pull this off :-)) I am just very happy for Nick. It's a big encouragement for him to keep going. It gets him of the couch into the outdoors. Thanks all you guys. Great support. What a hat trick. Dad, son and Mum. Im so impressed! Wonderful work! Man, you guys did this with a shared camera? I am SOOOOO impressed. Congratulations! Congrats! Your on a roll. Don't stop. And yet another ribbon! You need to complain more often, LOL! 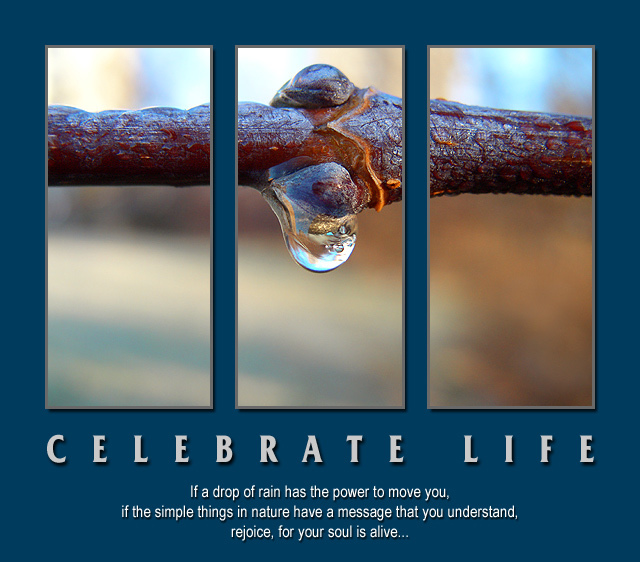 Absolutely love every single thing about this except the choice of font for "Celebrate Life". Wonderful shot and great choice of using the triptych. this really pops out at you. i like the split up effect. the BG color is good. Beautiful overall, and interesting (and surprising) when you look closely. The fake triptych format works very well. I really like the layout and design of this photo - well done; it looks very professional. First, let me say that I love everything about this entry except for not crediting Eleonora Duse with the original quote. It originally said "If a blade of grass has the power...". Great image and outstanding photoshop composition. the split in three, the shadow behind image and text, the clarity of the image itself, it all adds to an outstanding poster. Another beautiful motivational message and the image works very well indeed. I am not convinced by the decision to split the image into three panels not the drop shadow effect around each panel. Border colour and font choices work well. Great composition, beautiful colors and a nice sentiment. Nice take on the challenge. The three windows work well with this shot. Good job. Man! What a poster! Great quote/saying, love the break down of the shot! Everything is top notch! 10! Definitely one of the best in the challenge IMO. Love the separation of the 3 photos you have used. I really like the blue border and feel it adds something to the poster that plain black wouldn't have. Great quote as well. Good luck with the challenge!!! Beautifully done. Compliments only. Love it. Overall it's well presented, but the image should be powerful enough to stand on it's own, and I don't think that this one is. You're verging on too much text as well - the message should be more succinct. I'm guessing that this might be the one in the forum that you were worried about. I won't vote it down, because its obvious you used just one picture. If you have no idea what I'm talking about, I apologize ;). I like the idea, and the foucus is great. Gorgeous! The typography is excellent as is the image! "10"
Ironically, dividing the picture into 3 parts emphasizes the simplicity of the subject. I think you picked an unusual background color, but I don't think I have a better suggestion either. I like the main type, but I think I'd have used a slightly more calligraphic (but simple) font for the quotation. Absolutely stunning. I love the split into three frames here. Proudly hosted by Sargasso Networks. Current Server Time: 04/18/2019 08:39:09 PM EDT.